Yesterday, my friend Nami and I, went to the ATM, next block to my office. 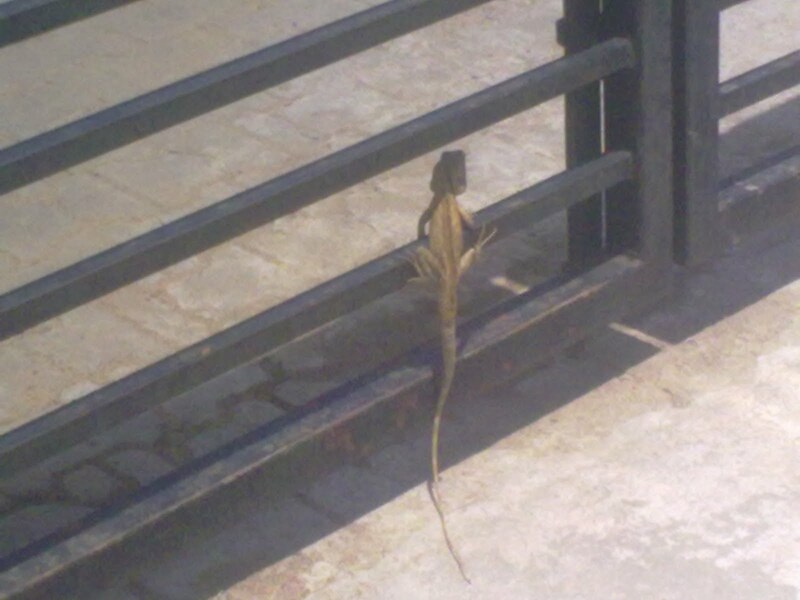 When, we came near our office entrance, I saw a Chameleon (nick named Chame), common brown coloured one, poising itself casually on the black iron gate. I switched on the camera in my mobile to click a picture of ?him and was fumbling with purse in one hand and the mobile with the other. After few unsuccessful attempts, I succeeded in capturing his slender yet majestic frame from behind, while Nami stood there patiently and watched me taking the picture. I told her then, I am planning to write a blog on Chame. I left Chame and went to the ATM, took money and came back to office, my eyes flew to the gate, where Chame sat, but disappointed to find him missing. Wondered, if Chame had a family, a girl friend, a kid maybe. How old could he be? Is there a chance, he still is a bachelor, trying to find a girl for himself. Where does he reside? Do they have a familiar setup like ours? Do they read Physics, Chemistry and Math like us too? Why god is so cunning? Why did he creat all those mathematical formulas and chemical equations for us to battle with, while left other living beings free and allow them to live as they wish? Why men are so greedy, that they want to swim like a Fish and scale the length of the sky like an Eagle? Charles Babbage invented computer but we can live with out it. Wright brother's invented air plane and we can live with out it. Edison found electricity, ?we can live with out it. Guess we should be able to. Einstein found the theory of relativity, sorry I am not commenting about this part, as I don't have a clue what it is all about. Newton arrived at the law of gravitation, even if he didn't name it as gravity, still we would have had it, but with out a name. We discovered/invented things, from what already existed. But, thats all about living. The mandatory thing is survival and it is all about, eating, sleeping, living, loving and fighting. It can be done inside a bungalow, in a small hut, roadside or on a tree like Chame does. Do, chameleons have their school too? Someone should have taught them how to survive, how just by flick of my wrist on my camera, made Chame alert and vanish. Do they have teachers? How do they entertain themselves? Do they measure their tails with fellow Chames, the way my mom always measured my hair with my friends? The fascinating thing about lizard's family is the way they crawl, the way they target at their prey, the way they shed their tails, when in danger. chameleons flaunt their tails, the way our men sport and style their beard, the way our women sway and walk. Chame looked grand, proud, when he tilted his neck and looked at me. The alacrity with which he moved was stunning, one moment he was there, the next he was not and appeared again out of thin air. But please don't conclude, that because I watched lizards or its family, I am not scared of it, as long as they stick to the wall, I am fine with it, but if they cross their borders, then I am not responsible for my actions. I am also fine with cockroaches as long as they don't fly! My mom who is superstitious, referred to the hindu vedic calendar called "Panchangam", where there is an exclusive part which foretells the good/evil things that could happen, when a lizard falls on a particular part of a human body. My mom read aloud "shoulder" no: 7 "death", I was scared to death for few days. Later, I knew what the panchangam could have meant. The way I danced around, I could have smashed and crushed poor liz to death. The calendar was not clear about whose death. Note: I dedicate this post to Chame and to his existing / future family. This post can be boring to you and I am not responsible if you grind your teeth and had to pay your dentist a huge bill. I plan to label this as humor. You can dare me! But, am not planning to change the label, even for you. If Chame challenges me, then I might remove that tag. @Rhea says "Survival but continued fighting in the heart and soul; writing is sitting the trial itself"
@harsha ;) Yep! "Eeow! I'm A Good Girl, I am!" This is not from Chame , but from the gate that Chame was seated upon. "Why oh why is Viji not writing about me... the inswings and outswings of my life...if her next post isnt about me then i am not opening up for her the next time she comes to office"
Viji, you look at a chame at the gate and think so much just can't imagine! your post made me laugh, Kudos to you! @Manoj I removed the caps from all the common nouns... thnx for pointing it out, offline. The word "nice" told me, everything... will definitely try to write a better post next time. I always love our office main door, sturdy, not too tall, not too short, perfect and elegant...may be I will write a poem on the doors. He he:) I'm PPKL (Pet pakad ke laughing) now. Good, one day, i will be gifting u with a chameleon.. may be on ur bday..
well u wrote about a small creature next to u, u missed out that big creature who stood all along with u, till u clicked..
@devs thanks devs... my b'day falls on 2nd may... waiting for your gift..and it's going to be 40th b'day, a Chame might lighten up my mood....an nami, hear hear! how bad na your devka :| fight with her..Now! Thanks Ganesh a.k.a cranky boy :) now I know that you like elephant, mongoose, zebra... will write on them too and tag you :) thanks for the read Ganesh!